Comely widow Charlotte Kennedy is in over her head. Between running a huge ranch and keeping a cruel rancher at arms length, she doesn’t need the added distraction of romance. Colter Valley calls to Rafe Preston, who decides to purchase land and settle there. When he accepts a temporary job at a beautiful widow’s ranch, he has no idea how much it will impact his plans. Passion, deception and treachery, blend into a beautiful love story, set in 1860s Montana Territory. “So you prefer to eat alone then?” he prodded, finding amusement when she bristled, scowling at him. “Mr. Preston, is the wood not getting heavy in your arms?” Once again she returned to her sewing and pulled the needle through the fabric with deft smooth motions. When Rafe put the wood on the edge of the porch, she looked up with a questioning expression, then frowned. 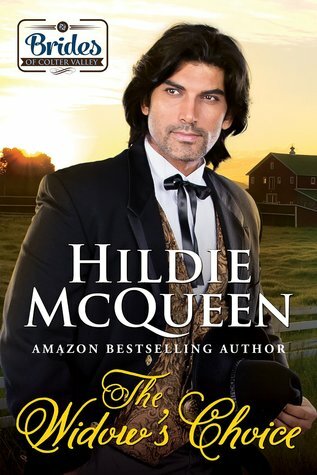 Posted on August 4, 2015, in Release Day Excerpt and tagged Brides of Coler Valley, excerpt, Hildie McQueen, Historical Romance, Release Day, romance, The Widows Choice, Western. Bookmark the permalink. Leave a comment.